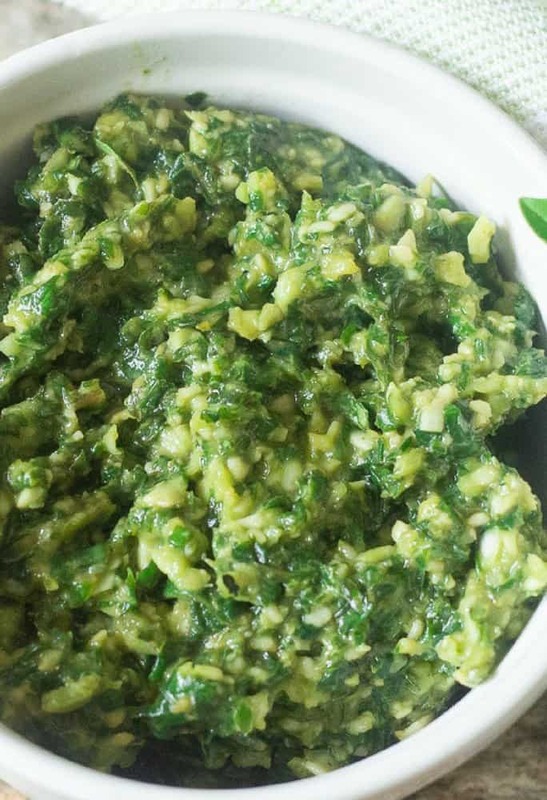 Homemade Basil Pesto, is nut-free and perfect for so many recipes! Leaving out the pine nuts does not reduce the flavor of this basil pesto, it just reduces calories! woohoo! This is a healthy pesto recipe with basil that can make so many recipes from basil pesto pasta, pesto zoodles to my very popular Healthy Tuscan Bean Salad! A low-fat basil pesto because I make this without pignoli nuts. It’s a perfect way to add flavor to so many meals and appetizers, without adding extra calories! My garden is blooming and one of my favorite herbs is basil! I love basil because I can grow it year round. Basil is so versatile and I love that I can make a healthy pesto recipe using basil without using pine nuts. I have a low-fat pesto that makes amazing pesto pasta, chicken pesto, shrimp pesto….endless possibilities. 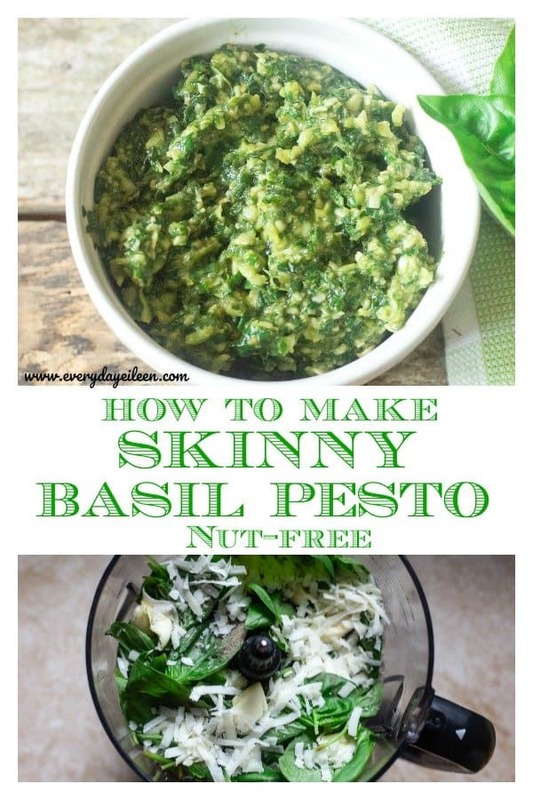 Skinny Basil Pesto is so much better than any store-bought pesto recipe loaded with preservatives. 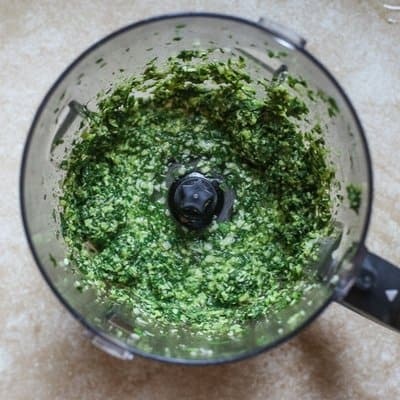 Being homemade, this is a healthy pesto recipe using clean ingredients and to keep calories lower. A nut-free pesto that everyone enjoys and perfect for those with a nut allergy. 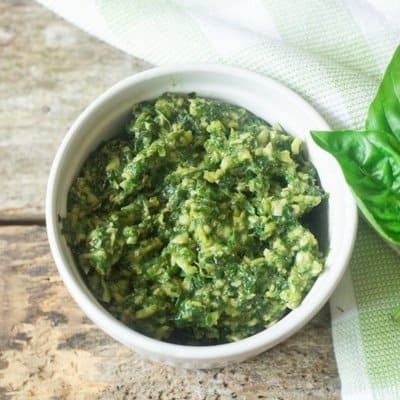 Some other recipes you may want to add this homemade skinny basil pesto into would be Eggplant Caprese Salad or Mediterranean Veggie Flatbread Pizza! How much basil pesto do you put on pasta? On one pound of pasta, I start with 1/2 cup. Check for seasoning and depends what else I am adding to the pasta. Can you freeze fresh Healthy Basil Pesto? Yes. To freeze, put 2 Tablespoons of the pesto into each bucket of an ice cube tray (seriously my favorite icecube tray ever – Check out the link below in Shop to make Skinny Basil Pesto) and then once frozen, place each cube into a freezer bags. Basil Pesto can be kept in the freezer for about 3 months. How long can Healthy Pesto Recipe with Basil be kept in the fridge? Low-fat basil pesto can keep in the fridge, well covered in a storage container for about 4-5 days. Basil Pesto can be kept in the freezer for about 3 months well wrapped. What are the origins of basil pesto? Pesto originated in the Liguria region of Northern Italy. I have read that basil was abundant in India and brought to Italy where it also abundantly grew. Ninja Blender/Food Processor: one of my two favorite multi-use kitchen appliances. My Favorite Ice Cube Trays: The BEST Ice Cube Trays ever! Be sure to use fresh Basil with healthy green leaves. If basil leaves are black, do not use. The basil has gone bad. 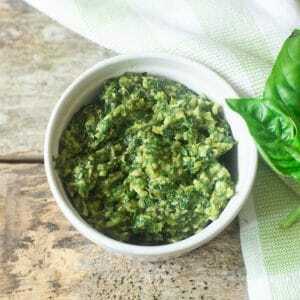 There are just a few ingredients in basil pesto, Use a good Pecorino Romano Cheese for the best flavor. Always taste your basil pesto for seasoning. Re-season if needed. 1. Place fresh basil in the food processor. 2. Add the Pecorino Romano, garlic cloves, pepper, and salt. Blend well. 3. 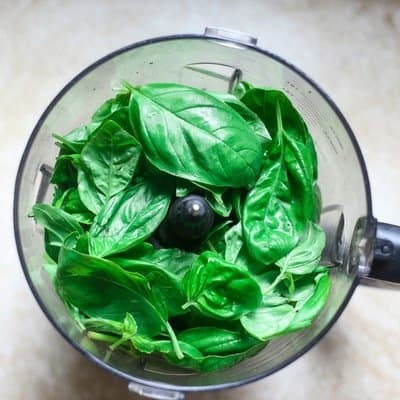 Process the food processor to blend the basil leaves and other ingredients, about 1 minute. great hostess gift. Present the basil pesto in a mason jar to your host. pizza, I can keep going with the possibilities. When you make Homemade Skinny Basil Pesto or add it to any recipes, take a pic and tag me on Instagram @everyday_eileen or #everydayeileen. We love seeing your recipes and I try to repost the pics. Are you loving this yummo Skinny Basil Pesto, giving it a 5-star rating and any comments are super helpful for me and very much appreciated! Skinny Basil Pesto is perfect over pasta or added into many dishes including frittatas, chicken, and shrimp. A perfect addition to any veggie dish. 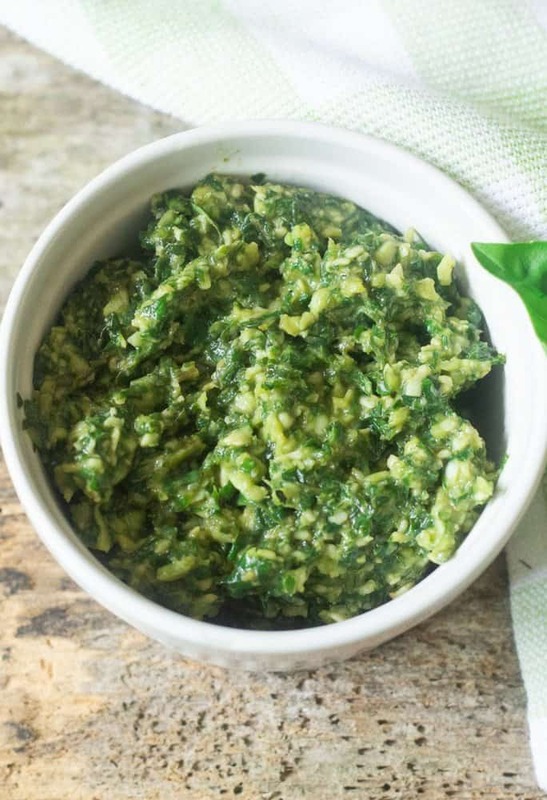 This easy low-calorie pesto is nut-free and freezes really well! 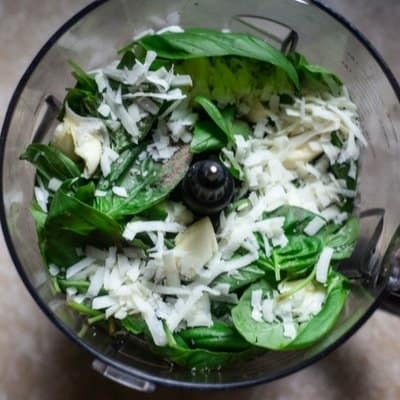 In a food processor, combine fresh basil, Pecorino Romano cheese, and garlic. Pulse until coarsely chopped. While running food processor on low, slowly add olive oil until mixture is well blended. Check the pesto mixture after adding the 1/4 cup of olive oil. Depending on how well you packed your basil, you may need a bit more olive oil, no more than 1/3 of a cup of olive oil. Season with the pepper and salt, to taste. Use right away or freeze in ice cube trays. 2 Tablespoons in each cube. Once frozen, place in freezer bags and use as needed. I use within 3 months. The basil pesto keeps in the fridge, well covered for about 3-4days. This recipe was originally published in October 2016. I have tweaked the recipe and updated the article posted today. We must live nut-free, but with this delish recipe, we never miss them! Absolutely Rachel, I am so glad you enjoy this nut-free basil pesto! I agree I don’t miss the nuts in this pesto, it’s delish! Is the service size really one teaspoon? I am so happy you enjoyed the recipe! This is one of those recipes that I love to have on hand. It’s so versatile and adds that fresh pop of flavors to so many great dishes…we love adding it to an adult grilled cheese! I love that it freezes so well so I can make a big batch and thaw some out whenever I want to use it! Meagan, grilled cheese with skinny basil, pesto fresh mozzarella, and eggplant! delish! I love healthier (but just as tasty) recipes of my favorites and this one is definitely that! So happy to have this recipe! I am so glad you enjoy the recipe! This looks so fresh!! I love that it’s a “Skinny” version of pesto. I would put this sauce on top of literally everything!! I can’t wait to make it. Our favorite go-to Basil Pesto. I never liked pine nuts and this is so easy. We make it in a big batch and freeze!